DENVER, Feb. 8, 2018 — (PRNewswire) — Based on a short story by Canadian director and producer Bruce Stacey ("God Rocks!," "Journey to Christmas"), " Ice Dragon: Legend of the Blue Daisies" will premiere in U.S. cinemas for a two-day-only event. This is the ﬁrst of a planned trilogy that will follow the adventures of Melody, a gifted young dreamer, and her feisty friend Leif, as they work together to save their village from a menacing dragon. Fathom Events, Chelsea Road Productions and Tricord Media present "Ice Dragon: Legend of the Blue Daisies" in movie theaters nationwide on Saturday, March 24 at 12:55 p.m. and Monday, March 26 at 6:30 p.m. (all local times). Audiences will also enjoy an original live-action short film featuring children's reactions to important themes raised in the feature content, as well as an exclusive music video. Tickets for "Ice Dragon: Legend of the Blue Daisies" can be purchased beginning Friday, February 9 online by visiting www.FathomEvents.com or at participating theater box offices. Fans throughout the U.S. will be able to enjoy the event in nearly 700 select movie theaters through Fathom's Digital Broadcast Network (DBN). For a complete list of theater locations, visit the Fathom Events website (theaters and participants are subject to change). "The original story sat in my drawer for more than 20 years until I was encouraged by friends at Cartoon Conrad Productions (Kulipari-Netﬂix Original Series) to dust it off and adapt it for the screen," Director and Producer Bruce Stacey said. "I am thrilled this family adventure is making it to the big screen for audiences nationwide to enjoy." Melody, a gifted young dreamer, and her feisty friend Leif must set aside their differences and use the power of magical Blue Daisies and an ancient Song to save their world from an evil Ice Dragon. When the blue flowers that once bloomed all around her village began to disappear, Melody and her eccentric grandfather recognize this as a sign of great danger... but no one believes them! Racing against time, Melody must convince Leif and the other villagers before it's too late. 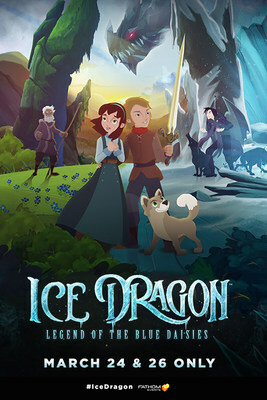 Starring the voice talents of Rheal Rees (Melody), Justin Debé (Leif) and Bill Bray (Nicholai), "Ice Dragon: Legend of the Blue Daisies" features original songs and engaging characters that highlight this inspiring animated adventure for the whole family. "The best part of the event cinema experience is being able to enjoy it with the whole family," Ray Nutt, CEO of Fathom Events said. "This inspirational feature offers a vibrant interactive experience for young and old fans alike. 'Ice Dragon: Legend of the Blue Daisies' will bring families together in faith, hope and fun, all at their local cinema." For artwork/photos related to "Ice Dragon: Legend of the Blue Daisies," visit the Fathom Events press site. Fathom Events is the leading event cinema distributor with participating theaters in all 100 of the top Designated Market Areas®, and ranks as one of the largest overall distributors of content to movie theaters. Owned by AMC Entertainment Inc. (NYSE: AMC), Cinemark Holdings, Inc. (NYSE: CNK) and Regal Entertainment Group (NYSE: RGC) (known collectively as AC JV, LLC), Fathom Events offers a variety of one-of-a-kind entertainment events in theaters such as live performances of the Metropolitan Opera, top stage productions including Newsies! The Broadway Musical and George Takei's Allegiance, major sporting events such as Mayweather vs. McGregor, epic concerts with artists like Grateful Dead and Dixie Chicks, the yearlong TCM Big Screen Classics series, inspirational events such as Steve McQueen: American Icon and In Our Hands, and beloved anime titles like Princess Mononoke and Spirited Away. Fathom Events takes audiences behind the scenes for unique extras including audience Q&As, backstage footage and interviews with cast and crew, creating the ultimate VIP experience. Fathom Events' live digital broadcast network ("DBN") is the largest cinema broadcast network in North America, bringing live and pre-recorded events to 897 locations and 1,387 screens in 181 DMAs. For more information, visit www.fathomevents.com. Chelsea Road Productions is an award-winning, Canadian-based production company that has produced internationally released broadcast series, animated films, and state-of-the-art media exhibits at five World Exhibitions. A commitment to producing family-friendly entertainment and telling stories that uplift and inspire, continues to be the passion and mission of the company, established in 1990. For more information, visit www.chelsearoad.com.